This library has been made to easily interface and use the DS3234 RTC with the Arduino and chipKit development boards. 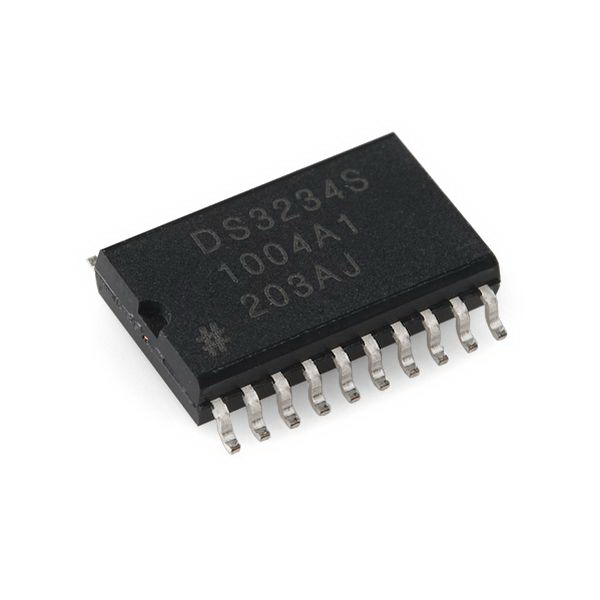 The DS3234 is a low-cost, extremely accurate SPI bus real-time clock (RTC) with an integrated temperature-compensated crystal oscillator (TCXO) and crystal. 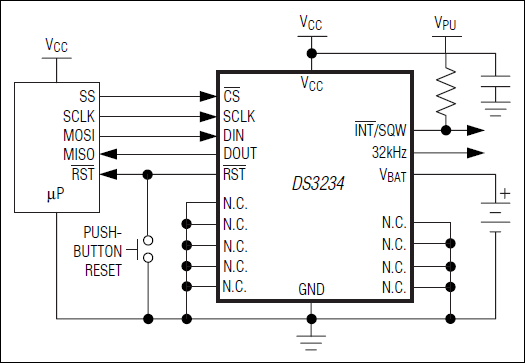 The DS3234 incorporates a precision, temperature-compensated voltage reference and comparator circuit to monitor VCC. When VCC drops below the power-fail voltage (VPF), the device asserts the RST output and also disables read and write access to the part when VCC drops below both VPF and VBAT. The RST pin is monitored as a pushbutton input for generating a μP reset. The device switches to the backup supply input and maintains accurate timekeeping when main power to the device is interrupted. The integration of the crystal resonator enhances the long-term accuracy of the device as well as reduces the piece-part count in a manufacturing line. The DS3234 is available in commercial and industrial temperature ranges, and is offered in an industry-standard 300-mil, 20-pin SO package. The DS3234 also integrates 256 bytes of battery-backed SRAM. In the event of main power loss, the contents of the memory are maintained by the power source connected to the VBAT pin. The RTC maintains seconds, minutes, hours, day, date, month, and year information. The date at the end of the month is automatically adjusted for months with fewer than 31 days, including corrections for leap year. The clock operates in either the 24-hour or 12-hour format with AM/PM indicator. Two programmable time-of-day alarms and a programmable square-wave output are provided. Address and data are transferred serially by an SPI bidirectional bus. 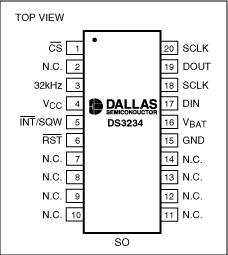 The DS3234 is a lot more accurate than the DS130x RTC chips.